This article is about the 1985 film directed by John Hughes. For other uses, see The Breakfast Club (disambiguation). The Breakfast Club is a 1985 American comedy-drama film written, produced, and directed by John Hughes. It stars Emilio Estevez, Anthony Michael Hall, Judd Nelson, Molly Ringwald and Ally Sheedy as teenagers from different high school cliques who spend a Saturday in detention with their strict and grumpy assistant principal (Paul Gleason). The film premiered in Los Angeles on February 7, 1985. Universal Pictures released it in cinemas in the United States on February 15, 1985. It received critical acclaim and earned $51.5 million on a $1 million budget. Critics consider it among the greatest films of all time, as well as one of Hughes's most memorable and recognizable works. The media referred to the film's five main actors as members of a group called the "Brat Pack". In 2016, the film was selected for preservation in the United States National Film Registry by the Library of Congress as being "culturally, historically, or aesthetically significant". The film was digitally remastered and was re-screened throughout 430 theaters in celebration of its 30th anniversary in 2015. On a Saturday, five high school students report for all-day detention. Each comes from a different clique: pampered Claire Standish, geek Brian Johnson, wrestler Andrew Clark, delinquent John Bender, and outcast Allison Reynolds. They gather in the school library, where assistant principal Richard Vernon instructs them not to talk, leave their seats, or sleep until they are released at 4:00 p.m. He assigns them a thousand-word essay, in which each must describe "who you think you are". He leaves, returning only occasionally to check on them. John, who has an antagonistic relationship with Vernon, ignores the rules and riles up the other students, teasing Brian and Andrew and harassing Claire. Vernon gives John several weekends' worth of additional detention and eventually locks him in a storage closet, but he escapes and returns to the library. The students pass the hours by talking, arguing, and, at one point, smoking marijuana. Gradually, they open up and reveal their secrets: Claire has experiences of peer pressure, John comes from an abusive household, Allison calls herself a compulsive liar, Andrew can't think for himself, and Brian contemplated suicide over a bad grade. They discover they all have poor relationships with their parents: Claire's parents use her to get back at each other during arguments, John's parents physically and verbally abuse him, Allison's parents ignore her, and Andrew's father pushes him to the limit, especially in wrestling, and Brian's parents pressure him to earn high grades. The students realize that, despite their differences, they face similar problems. Claire gives Allison a makeover, which sparks romantic interest from Andrew. Claire decides to break her "pristine" virginal appearance by kissing John and giving him a hickey. Although they suspect their new relationships will end along with their detention, they believe their mutual experiences will change the way they look at their peers. As the detention nears its end, the group requests that Brian complete the essay for everyone, and John returns to the storage closet to fool Vernon into thinking he has not left. Brian leaves the essay in the library for Vernon to read after they leave. As the students part ways, Allison and Andrew kiss, as do Claire and John. Allison rips Andrew's state champion patch from his jacket to keep, and Claire gives John one of her diamond earrings, which he puts on. Vernon reads the essay, in which Brian states that Vernon has already judged who they are using stereotypes; in fact, the students found that "each one of us is a brain, and an athlete, and a basket case, a princess, and a criminal." Molly Ringwald and Anthony Michael Hall both starred in Hughes's 1984 film Sixteen Candles. 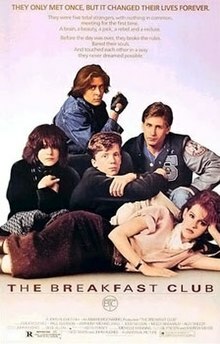 Towards the end of filming, Hughes asked them both to be in The Breakfast Club. Hall became the first to be cast, agreeing to the role of Brian Johnson; his real life mother and sister playing the same roles in the film. Ringwald was originally approached to play the character of Allison Reynolds, but she was "really upset" because she wanted to play Claire Standish (then named "Cathy" in the first draft of the script), which saw the auditions of Robin Wright, Jodie Foster, and Laura Dern. She eventually convinced Hughes and the studio to give her the part. The role of Allison ultimately went to Ally Sheedy. Emilio Estevez originally auditioned for the role of John Bender. However, when Hughes was unable to find someone to play Andrew Clark, Estevez was recast. Nicolas Cage was considered for the role of John Bender, which was the last role to be cast, though the role was narrowed down to John Cusack and Judd Nelson. Hughes originally cast Cusack, but decided to replace him with Nelson before shooting began, because Cusack did not look threatening enough for the role. At one point, Hughes was disappointed in Nelson because he stayed in character and harassed Ringwald off-camera, with the other actors having to convince Hughes not to fire him. Rick Moranis was originally cast as the janitor but left due to creative differences and was replaced by John Kapelos. In 1999, Hughes said that his request to direct the film met with resistance and skepticism because he lacked filmmaking experience. Hughes ultimately convinced the film's investors that due to the modest $1 million budget and its single location shoot, he could greatly minimize their risk. Hughes originally thought that The Breakfast Club would be his directorial debut. Hughes opted for an insular, largely one-room set and wrote about high school students, who would be played by younger actors. Principal photography began on March 28, 1984, and ended in May. Filming took place at Maine North High School in Des Plaines, Illinois, which had closed in 1981. The same setting was used for interior scenes of Hughes's 1986 film Ferris Bueller's Day Off, which featured exterior shots from nearby Glenbrook North High School. The library at Maine North High School, considered too small for the film, prompted the crew to build the set in the school's gymnasium. The actors rehearsed for three weeks and then shot the film in sequence. On the Ferris Bueller's Day Off DVD commentary (featured on the 2004 DVD version), Hughes revealed that he shot the two films concurrently to save time and money, and some outtakes of both films feature elements of the film crews working on the other film. The first print was 150 minutes in length. During a cast reunion in honor of the film's 25th anniversary, Ally Sheedy revealed that a Director's Cut existed but Hughes's widow did not disclose any details concerning its whereabouts. In 2015 the first draft of the film's script was discovered in a Maine South High School cabinet as district employees were moving offices to a new building. The film's poster, featuring the five characters huddled together, was photographed by Annie Leibovitz toward the end of shooting. The shot of five actors gazing at the camera influenced the way teen films were marketed from that point on. The poster refers to the five "types" of the story using slightly different terms than those used in the film, and in a different sequence, stating "They were five total strangers with nothing in common, meeting for the first time. A brain, a beauty, a jock, a rebel and a recluse". The main theme of the film is the constant struggle of the American teenager to be understood, by adults and by themselves. It explores the pressure put on teenagers to fit into their own realms of high school social constructs, as well as the lofty expectations of their parents, teachers, and other authority figures. On the surface, the students have little in common with each other. However, as the day rolls on, they eventually bond over a common disdain for the aforementioned issues of peer pressure and parental expectations. Stereotyping is another theme. Once the obvious stereotypes are broken down, the characters "empathize with each other's struggles, dismiss some of the inaccuracies of their first impressions, and discover that they are more similar than different". The main adult character, Mr. Vernon, is not portrayed in a positive light. He consistently talks down to the students and flaunts his authority throughout the film. Bender is the only one who stands up to Vernon. The film premiered in Los Angeles on February 7, 1985. Universal Pictures released the film in cinemas on February 15, 1985 in the United States. In 2003, the film was released on DVD as part of the "High School Reunion Collection". In 2008, a "Flashback Edition" DVD was released with several special features, including an audio commentary with Anthony Michael Hall and Judd Nelson. A 25th Anniversary Edition Blu-ray was released in 2010, and the same disc was re-released with a DVD and digital copy in 2012 as part of Universal's 100th Anniversary series. On March 10, 2015, the 30th Anniversary Edition was released. This release was digitally remastered and restored from the original 35mm film negatives for better picture quality on DVD, Digital HD and Blu-ray. On October 16, 2017, The Criterion Collection announced that the film was to be released in a special edition in January 2018. The film received high critical acclaim. Kathleen Carroll from the New York Daily News stated, "Hughes has a wonderful knack for communicating the feelings of teenagers, as well as an obvious rapport with his exceptional cast–who deserve top grades". Review aggregator website Rotten Tomatoes gives the film an 88% approval rating based on 60 reviews, with an approval rating of 7.7/10. Review aggregator Metacritic assigned the film a weighted average score of 62% based on 11 reviews from mainstream critics, considered to be "generally favorable reviews". In February 1985, the film debuted at #3 at the box office (behind blockbuster film Beverly Hills Cop and Witness starring Harrison Ford). Grossing $45,875,171 domestically and $51,525,171 worldwide, the film is a box office success, given its alleged $1 million budget. Anthony Michael Hall, Judd Nelson, Molly Ringwald, Paul Gleason and Ally Sheedy all won a Silver Bucket of Excellence Award at the 2005 MTV Movie Awards in 2005. The Breakfast Club is known as the "quintessential 1980s film" and is considered as one of the best films of the decade. In 2008, Empire magazine ranked it #369 on their The 500 Greatest Movies of All Time list. It then rose 331 places to rank at #38 on their 2014 list. Similarly, The New York Times placed the film on its Best 1000 Movies Ever list and Entertainment Weekly ranked the film number 1 on its list of the 50 Best High School Movies. In the 2001 parody film Not Another Teen Movie, Gleason reprised his role as Assistant Principal Vernon in a short scene that parodies The Breakfast Club. The Breakfast Club soundtrack album was released on February 19, 1985 by A&M Records. The album peaked at No. 17 on the Billboard 200 album chart. The song "Don't You (Forget About Me)" performed by Scottish rock band Simple Minds was released on February 20, 1985 in the United States and on April 8, 1985 in the United Kingdom as a single and reached No. 1 on the Billboard Hot 100. In a June 25, 1985 review for The Village Voice, music critic Robert Christgau gave the album a "D−" and said that it has "utterly negligible" songs, and he commended Simple Minds for trying to distance themselves from their song, "Don't You (Forget About Me)", best known for being played during the film's opening and closing credits. In a retrospective review for AllMusic, Stephen Thomas Erlewine gave the soundtrack three out of five stars and wrote that, apart from Simple Minds' "undisputed masterpiece," the album is largely "disposable" and marred by "'80s artifacts" and "forgettable instrumentals". ^ "The Breakfast Club". Bbfc.co.uk. Retrieved July 30, 2014. ^ "The 80's: 'The Breakfast Club'". Retrieved September 29, 2014. ^ "The Breakfast Club". Box Office Mojo. Retrieved June 2, 2018. ^ Daniel Kreps (December 14, 2016). "'Breakfast Club,' 'Rushmore' Among Films Added to National Film Registry". Rolling Stone. Retrieved December 21, 2017. ^ Michael O'Sullivan (December 14, 2016). "National Film Registry honors 'Breakfast Club,' 'Rushmore' and other teen angst movies". The Washington Post. Retrieved December 21, 2017. ^ "Breakfast Club 30". BreakfastClub30.com. ^ a b Itzkoff, Dave (September 17, 2010). "She Won't Forget About Him: Molly Ringwald Remembers John Hughes". The New York Times. Retrieved September 4, 2011. ^ a b Steinberg, Julie (September 21, 2010). "'The Breakfast Club' Cast Reunites, But Where's Emilio? 'Working on 'Mighty Ducks 5". The Wall Street Journal. Retrieved March 28, 2012. ^ Gora, Susannah (2010). You Couldn't Ignore Me If You Tried. Three Rivers Press. pp. 56–57. ^ "Premiere, December 1999, Oral history "Breakfast Club"". comcast.net. ^ Gora, Susannah (2010). You Couldn't Ignore Me If You Tried. Three Rivers Press. p. 47. ^ Gora, Susannah (2010). You Couldn't Ignore Me If You Tried. Three Rivers Press. pp. 59, 69. ^ Dameron, Emerson (August 11, 2009). "John Hughes: The Director's Cut". Newcity Film. Retrieved March 28, 2012. ^ Jennifer Johnson (April 21, 2015). "Original 'Breakfast Club' screenplay found in District 207 cabinet during move". Chicago Tribune. Retrieved January 20, 2017. ^ Gora, Susannah (2010). You Couldn't Ignore Me If You Tried. Three Rivers Press. pp. 79-80, 325-326. ^ a b Loukides, Paul (1996). Beyond the Stars 5: Themes and Ideologies in American Popular Film. Popular Press. pp. 30–32. ISBN 9780879727017. ^ Barsanti, Chris (2010). Filmology: A Movie-a-Day Guide to the Movies You Need to Know. Adams Media. p. 49. ^ "The Breakfast Club". Oup.com. Retrieved September 9, 2013. ^ "The Breakfast Club (High School Reunion Collection): Molly Ringwald, Emilio Estevez, Anthony Michael Hall, Judd Nelson, Ally Sheedy, John Kapelos, Paul Gleason, John Hughes, Ned Tanen: Movies & TV". Amazon.com. Retrieved July 30, 2014. ^ "The Breakfast Club (Flashback Edition): Emilio Estevez, Anthony Michael Hall, Molly Ringwald, Ally Sheedy, Judd Nelson, Paul Gleason, Mercedes Hall, John Kapelos, Ron Dean, Perry Crawford, Fran Gargano, John Hughes, Tim Gamble, Jackie Burch, Thomas del Ruth: Movies & TV". Amazon.com. Retrieved July 30, 2014. ^ "The Breakfast Club (25th Anniversary Edition) [Blu-ray]: Emilio Estevez, Paul Gleason, Anthony Michael Hall, Judd Nelson, Molly Ringwald, Ally Sheedy, John Hughes: Movies & TV". Amazon.com. Retrieved July 30, 2014. ^ "The Breakfast Club (Blu-ray + DVD + Digital Copy) : Universal's 100th Anniversary". Amazon.com. Retrieved March 26, 2013. ^ "Celebrating 100 years of iconic movie moments". Universal 100th. Retrieved July 30, 2014. ^ "The Breakfast Club 30th Anniversary Edition Blu-ray". Blu-ray.com. Retrieved December 30, 2014. ^ Carroll, Cathleen (February 15, 1985). "'The Breakfast Club' is an endearing teenage comedy: 1985 review". New York Daily News. Retrieved March 6, 2018. ^ "The Breakfast Club (1985)". Rotten Tomatoes. Fandango Media. Retrieved April 11, 2018. ^ "The Breakfast Club Reviews". Metacritic. CBS Interactive. Retrieved March 6, 2018. ^ "Weekend Box Office: February 15-18, 1985—4-day President's Day Weekend". Box Office Mojo. Retrieved September 3, 2011. ^ Dunkleberger, Amy (2007). So You Want to Be a Film Or TV Screenwriter?. Enslow Publishers, Inc. p. 73. ^ "Empire's The 500 Greatest Movies of All Time". Empire. Retrieved August 5, 2010. ^ "The 301 Greatest Movies Of All Time — Empire — www.empireonline.com". Empire. ^ "The Best 1,000 Movies Ever Made". The New York Times. April 29, 2003. Retrieved August 5, 2010. ^ "Entertainment Weekly's The 50 Best High School Movies". AMC Filmsite.org. Retrieved August 5, 2010. ^ Scott, A. O. (December 14, 2001). "FILM REVIEW; Pretty in Prank: A Spoof of a Lampoon of a Satire of..." The New York Times. Retrieved March 28, 2012. ^ "What About "The Breakfast Club"?". The New Yorker. April 6, 2018. Retrieved March 26, 2019. ^ Christgau, Robert (June 25, 1985). "Christgau's Consumer Guide". The Village Voice. New York. Retrieved December 16, 2016. ^ Erlewine, Stephen Thomas. "The Breakfast Club [Original Soundtrack]". AllMusic. Retrieved December 16, 2016. Ringwald, Molly (April 6, 2018). "What About "The Breakfast Club"? - Revisiting the movies of my youth in the age of #MeToo". The New Yorker. Retrieved April 9, 2018.